Home > Economic growth, Genuine wealth, Poverty and development	> Rich keep getting richer in the U.S.
Rich keep getting richer in the U.S.
What does this graph from the New York Times showing income distribution in the U.S. have to do with the environment? Well, a lot actually. I’ve written a number of posts about the environmental perils of limitless economic growth. The relationship between growth and actual well-being has broken down in rich countries and it will be ecologically impossible to realize western standards of living the world over. Yet while growth is still a legitimate goal in most developing countries, it continues to be relentlessly pursued by all governments, under the guise that a growing economy will somehow makes us all better off. This graph reveals that there is in fact no shortage of capital floating around today but it is increasingly concentrated in the hands of very few people. I’m not talking about socialism. I’m talking about basic fairness. Why must a tiny minority have so much – more than they could ever need – when others have nothing? Someone please explain to me how this is beneficial or fair. 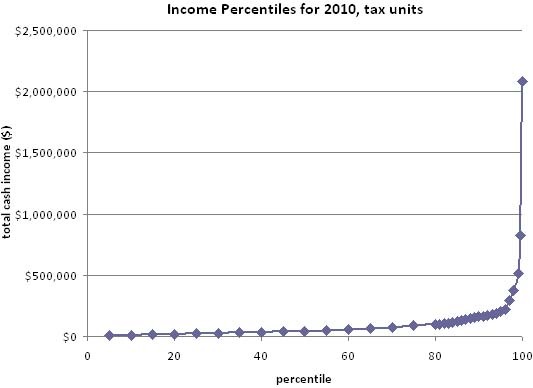 There will always be income disparity – some with more, some with less. But why does the average CEO in America make 262 times more than the average worker? Why should the CEO of Walmart earn more in an hour (nearly $17,000) than his average employee makes in a year? Why, following the greatest market crash since the Great Depression, did Wall Street pay out average bonuses of roughly half a million dollars in 2010 (17% more than 2009 bonuses)? I’m not sure what can be done about it, but it sure doesn’t seem right to me. Categories: Economic growth, Genuine wealth, Poverty and development Tags: Clive Hamilton, economic growth, endless growth, income disparity U.S.
Earthgauge News: selected environment stories for the week of Jan 16 Hottest. Year. Ever.